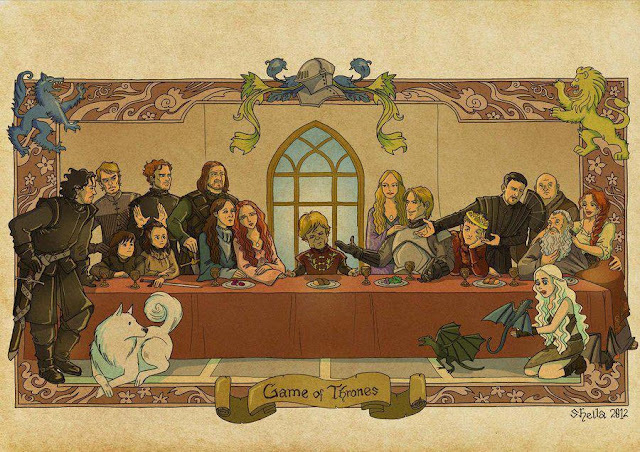 Got sucked into a Game of Thrones reddit thread and came across this Last Supper illustration by sheilalala on deviantart. My current and constant obsession together at last! The disciples of Christ (in this case Tyrion "The Imp" Lannister) are divided between House Stark and House Lannister (and the small council), which doesn't seem like a very cohesive group - and adds a few extra disciples. It also appears to make Catelyn Stark the Judas figure to Tyrion's Christ. She did kidnap him, sure, but I'm not far enough in the books to know if there's more to it than that.